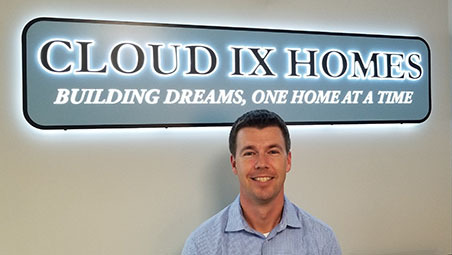 Cloud IX Homes was founded in 2006 by Patrick Ohlhorst. Patrick's vision was to offer a true custom experience where he can turn your dream home into a reality. Whether starting from a piece of scratch paper, or make personal modifications to an existing plan, your new luxury custom home will be crafted to meet your budget, needs, and lifestyle. Patrick's experience is backed by having built more than 170 homes for the nation's most successful luxury home builder while in the industry's most highly regarded construction & project management program. Cloud IX Homes was formed to offer this experience to those who seek a high quality custom home at a fair price. Additionally, Patrick's experience in the Northern Virginia area with a national luxury builder, teamed with an extensive local builder, subcontractor, and supplier network has set the foundation to provide new custom homes efficiently while utilizing the most up-to-date construction methodologies and scheduling techniques. Quality, perfection, energy efficiency, and minimal environmental impact are maintained with the superior construction of every Cloud IX Home.